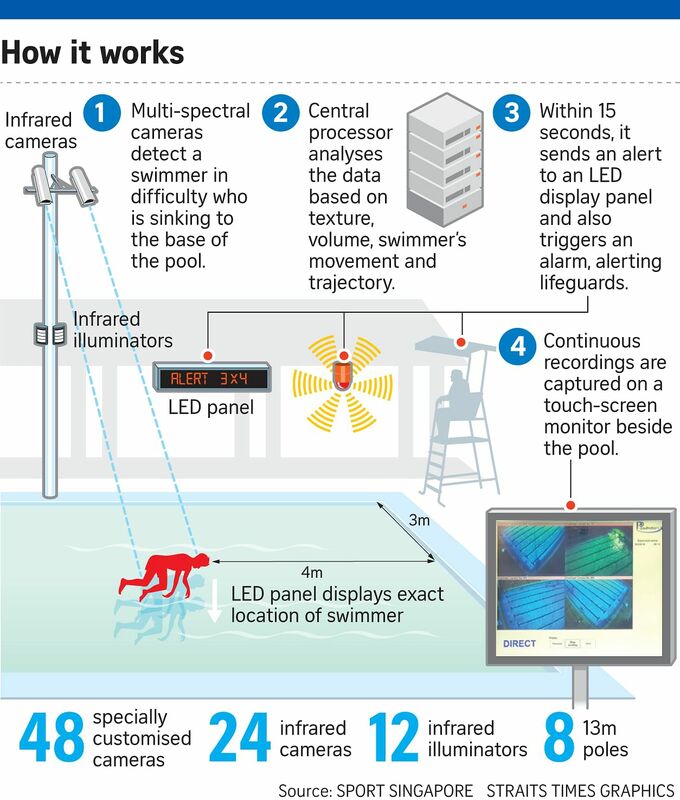 The Computer Vision Drowning Detection System will be installed at four public competition pools – in Hougang, Jurong West, Our Tampines Hub and Bukit Batok – by mid-2019 after a year-long trial. It will be rolled out to seven more pools by 2020. Last August, a 64-year-old man nearly drowned at the Hougang Swimming Complex after falling unconscious in its competition pool. Tragedy was averted as the pool was equipped with the computer vision drowning detection system (CVDDS), which was on trial then. The system sounded an alert upon detecting that the man had sunk to the pool floor, and the duty lifeguard managed to save him. Convinced by the system's effectiveness, national agency Sport Singapore (SportSG) will progressively implement it at all 28 public competition pools it operates across Singapore, Minister for Culture, Community and Youth Grace Fu said in Parliament yesterday. Public pools in Hougang, Jurong West, Our Tampines Hub and Bukit Batok will be equipped with the system by June, and seven more by April next year. Ms Fu said: "Using a network of overhead infrared cameras, the system enables early detection of possible drowning, thus making our pools safer." The system separates the pool into grids and uses software to analyse the real-time trajectories of swimmers. Lifeguards will be alerted within 15 seconds of someone sinking to the pool base. The system - which was put through more than 1,400 tests, and scenarios such as different weather conditions and unusual drowning positions - costs around $500,000 per pool, depending on varying infrastructural factors, said the Ministry of Culture, Community and Youth. In response to Nominated MP Irene Quay's question about equipping private swimming pools with the CVDDS, Ms Fu said: "At this point in time, the funding is for public pools. "As you can see, the implementation is quite phased out because we are still testing the technology and we want to make sure it gives us good value before we decide on broad-based implementation." Ms Delphine Fong, SportSG's sports safety director, said it relied on statistics compiled over 30 years in deciding to install the system in competition pools, which are up to 1.8m deep. The numbers show that from 1989 to 2017, there were 41 drow-ning incidents - 39 deaths and two near-drownings - with two-thirds of them happening in competition pools. Also, 25 out of the 39 deaths involved persons above the age of 40. Ms Fong explained that drowning swimmers are often unable to signal their distress. She said: "Passive drowning victims... lapse into unconsciousness and typically don't exhibit signs of struggle (before they) slowly sink to the pool base. In the case of active drowning, victims will use their arms to try to press (the surface) of the water to keep their head above water." Lifeguard Edwin Lim, 34, who has been attached to the Hougang Swimming Complex for 12 years, said that the system can be a valuable tool. "Because of the glare of the sun, we have poor visibility sometimes, as well as blind spots, and the system helps us detect (incidents) better," he added. Dr Chiang Hock Woon, SportSG's deputy chief executive officer, stressed that members of the public should continue to take safety precautions when swimming. He said: "We would like to re-iterate that the system or any technology does not replace the need for pool users to be responsible for themselves or their loved ones while using our facilities. "We look forward to working with our communities to promote stronger safety awareness and culture, and strive for zero incidents."